In a recent study (public release on 18 Oct. 2017), scientists from the Max Planck Institute for Chemical Physics of Solids in Dresden demonstrated unambiguous evidence for macroscopic symmetry breaking leading to robust Bain distortion in the premartensite phase of 10% Pt-substituted Ni2MnGa using high resolution synchrotron x-ray diffraction study. They show that the robust Bain-distorted premartensite phase results from another premartensite phase with preserved cubic-like symmetry through an isostructural phase transition. The Bain-distorted premartensite phase finally transforms to the martensite phase with additional Bain distortion on further cooling. 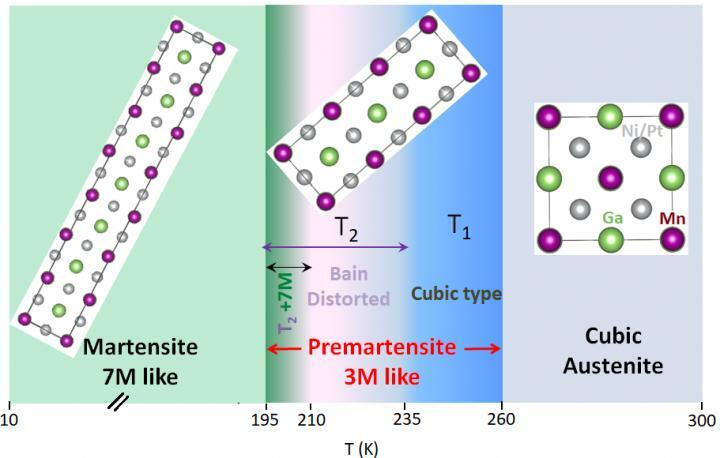 These results demonstrate that the premartensite phase should not be considered as a precursor state with the preserved symmetry of the cubic austenite phase. The gradual evolution of the Bain distortion can facilitate the emergence of an invariant habit plane. Therefore, such alloys may exhibit better reversibility due to lower hysteresis, which will enhance their applicability as magnetic actuators and in refrigeration technology. The MPI CPfS (http://www.cpfs.mpg.de) is part of the Max Planck Society and was founded in 1995 in Dresden. It consists of around 280 employees, of which about 180 are scientists, including 70 doctoral students.